Guess what, ladies and gentlemen? It’s Samsung Galaxy Note 2 day. With Samsung (and Kanye) putting together the final preparations for tonight’s big launch party in NYC, you can start your day of Note 2 coverage right here. I have had the T-Mobile version (since it’s the first to launch) for a handful of days now and am close to finalizing our review, however, with the RAZR HDs (our review) taking up quite a bit of time, I didn’t want to short change this phone and will need another day or two. So far though, I’m absolutely loving every minute of it. Let’s talk about it. With it’s 1.6GHz quad-core Exynos processor, 5.5″ HD Super AMOLED display (non-PenTile), 2GB RAM, 16GB internal storage, and Jelly Bean (Android 4.1.1), there is nothing stopping this phone. The display is probably the best I have seen to date, or is at least my favorite thus far. I know that many of you love LCD over Super AMOLED, but this thing, with it’s size and pixel arrangement, is absolutely gorgeous. Watching videos, playing games, and browsing the web never looked so good. The extra screen real estate is more than welcomed when consuming media. The camera is ultra-fast and seems to be on par with the Galaxy S3’s, TouchWiz seems to be faster and more well-rounded on top of Jelly Bean, and the S Pen, with it’s new feature-set, is very polished and fun to use. This is definitely one of those devices that you seem to find reasons to pull out and use again and again. Cons: It’s not 100% perfect, though. First off, it is huge. I still can’t decide if I could make this my daily device or not, and the only question mark really is the size. It’s awesome for at home, but I’m still trying to convince myself that this could be good in everyday, all day situations. The multi-window feature that we first reported on has yet to arrive on this handset, but will likely come in a later update. Unfortunately, that means we’ll have to wait for an update and you know how long those can take in the U.S. I haven’t been able to test battery life with LTE, since T-Mobile doesn’t have an LTE network yet. So far, it holds up nicely with the 3100mAh battery inside. The phone itself, is also quite the fingerprint magnet both on the display and backside thanks to a glossy finish. 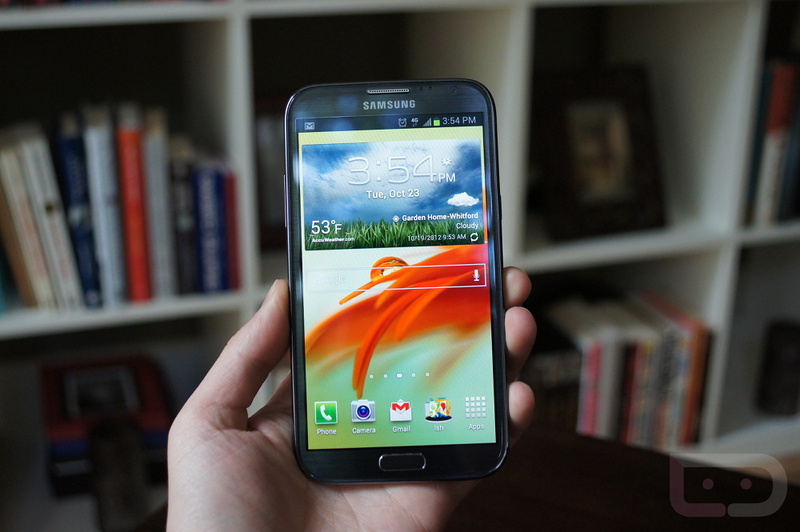 With a phone this big, I’ve found myself carrying around a cloth to wipe it off a couple of times a day. Last, there are parts of TouchWiz that I still can’t stand – like folder creation. Availability: You can buy the device today from T-Mobile. Sprint begins selling it tomorrow, October 25. AT&T opens pre-orders tomorrow, with the device hitting stores on November 9. Verizon, as usual, has remained quiet, although, we are hearing that it should go up for pre-order tomorrow. Overall: As someone that didn’t spend all that much quality time with the original Note, I can see why everyone was so disappointed when this didn’t come to all carriers. It’s a fun device to use. Will it be fun when I take it to Blazers games, to a restaurant, traveling, or out on the town? I’m still forming that opinion.